You will need some essential guitar building hand tools to tackle this project. Many of these hand tools are common woodworking tools you may already have. Regardless of how automated you have made or intend to make your process, in making guitars there will still be a good amount of work that will have to be done by hand. You might as well learn how so you can be successful. 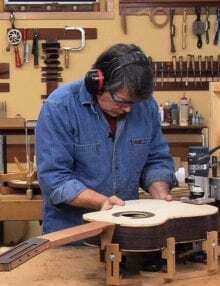 A few years ago I toured the Martin Guitar factory in Pennsylvania. It was no surprise that there were a number of people stationed at different parts of the process using hand tools. If hand tools are necessary in a guitar making factory that should tell you there is simply no way around it. You will need some hand tools and you will need to develop some skill. The list of hand tools below includes what I would consider essential hand tools for building guitars. You will find the types and sizes of tools you will need as well as some of the reasons why you will need them. Planes and scrapers are so important they have a page all to themselves. If you plan to build a quality guitar you will need to know how to use and sharpen your tools properly. Good hand tool work is what separates the really good guitars from the mediocre. In all my videos and classes I teach everyone how to properly use their tools so they can get optimal results and feel comfortable while doing so. One of my missions is to keep the craft alive and share what I have learned in ore than 40 years as a craftsman. To use your hand tools properly you need to be relaxed when you work. If someone looks awkward or is straining while using their tools they simply don’t know how to use them properly. I can always tell how much experience someone has by how well they handle their tools. Learning how to use your tools properly will pay dividends. You will be more comfortable working and you will produce better results. You will also not expend as much energy when you know what you are doing. If you are flailing all over the place you are wasting motion and energy. There is an optimal way to work and the good news is you can learn how. 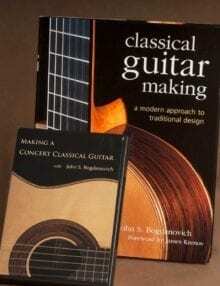 You will definitely need a set of chisels to make your guitar. I only use the four sizes listed below. If you are using chisels on softwoods like spruce and cedar the chisel needs to be very sharp. If not sharp the chisel will crush the fibers of these woods and not cut them. Chisels are sharpened just like plane blades. Learn to use them and sharpen them properly. There are videos on sharpening on this page . Many people have the mistaken belief that carving with a gouge or knife will take longer, or that it is very difficult, and therefore unnecessary. Nothing could be farther from the truth. If you know how to properly use and sharpen a gouge, carving a heel becomes very fast and very accurate. There is a video from the dvd series on carving a heel in the members section. Learn to carve by making a decorative box or something like that before you take your carving tools to your guitar. I promise you will not regret the time invested in learning how to use these tools. Chisels are not gouges and should never be used in place of one. Turing a chisel upside down to “carve” is a sure fire sign that you do not know what you are doing. Using a chisel with the bevel side down to carve makes it almost impossible to control the depth of cut. And carving is all about the depth of cut. You want to be taking a fine cut in order to control the shape you are trying to produce. I simply love carving. I’ve been woodworking a long time and one thing that I am especially grateful for is learning how to do early on is carving. Gouges and knives are the ultimate hand tools and they have many uses in guitar building. For building guitars you only need a couple of gouges and a knife but to use these tools properly you’ll need to develop some skill. To get skill you need practice. There are tons of simple carving projects that can get you started. To carve your gouges must be extremely sharp. If not too much force is required to make a cut which will always lead to disaster. Gouges are ground and sharpened very differently than chisels. They are a bit more difficult to sharpen. It takes some practice to become good at sharpening these. Stay tuned for videos on sharpening carving tools. The good new is these days carving tools come sharpened, and they come well sharpened. You will need to know how to properly sharpen before learning how to cut with them. If you can do good work with knives and gouges the rest is easy. Western back saws are great, however, they can’t hold a candle to Japanese hand saws for doing fine work. When I started making fine furniture I switched to Japanese hand saws because it was so much easier and more accurate cutting dovetails with these saws. It was possible to get the dovetails to fit perfectly right off the saw. Western saws will certainly cut a piece of wood but it is very difficult to achieve a high level of accuracy and produce great fitting joinery with one because the blade is so thick. Japanese hand saws are very well suited for guitar building. 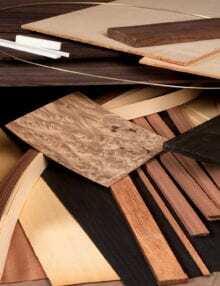 They are typically used on soft wood or plywood, but the hard wood used in guitar building is generally thin and cuts very well with these saws. Japanese hand saws cut on the pull stroke and therefore feel more natural to me and easier to control. Its easy to follow a straight line and adjust your cut with one of these saws. Japanese hand saws are great for fine woodworking and joinery because they have very thin blades with a very small amount of set to the teeth which makes a very narrow kerf. Set refers to the angle the teeth make with the surface of the blade. Teeth are not in line with the saw blade but splayed out to get the dust and chips out of the kerf as you cut. These saws also have many more teeth per inch than a western saw. Because of this they leave a pretty smooth surface behind that is easy to clean up. If you are new to this type of saw I suggest you practice cutting on some scrap wood until you can cut straight and square. Then progress to a simple woodworking project to try out your newly developed skill. Once comfortable with using the saw you will be off and running completely capable of using it on your expensive guitar wood. Once mastered, the saw will be one of your most often used hand tools. 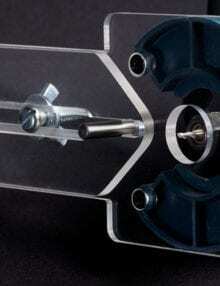 You will find yourself using it rather than your band saw at times because its fast and quiet. If your budget is tight you can get by with just one Japanese saw, a dozuki. Dozuki saws are generally used for cross-cutting. They have a stiff rib along the top edge of the blade which keeps the blade from twisting and keep it straight while you cut. This rib limits the depth of cut you can make with the saw but this should not be a problem with any of your guitar wood unless you are cutting it from large planks. The dozuki can cut anything up to about one inch of thickness without a problem. If you are cutting thicker stock a ryobi saw is the way to go. A ryobi saw has no rib on top and has cutting teeth on both edges. One edge is for cross-cutting, the other is for rip sawing. Without a rib this saw can be used to cut thick stock but takes some practice to make a perpendicular cut because the blade twists easily. I use mine mainly to cross-cut planks as sometimes planks are too thick to cut with a skill saw. And sometimes I just don’t want to deal with the noise. If you have never used one of these saws I highly recommend you try one. These saws may take some practice to use with confidence but you will not regret the time spent learning how. Files and rasps are hand tools that are used in just about every craft from metal working to woodworking. To build a guitar you will need some files and rasps. For certain tasks these tools are your best bet. Shaping the wings on a bridge as pictured on the left is a prime example where files and rasps are the best tools for the job. Rasps cut quickly. For guitar building you only really need one, a #50 pattern makers rasp. Pick this rasp up at an industrial supply company if you can. It will only cost you more at a luthier or woodworking supply company. This rasp cuts very fast and is a tapered half round often referred to as a “rat tail” shape. I use this rasp to set the shape of the barrel o the neck after initial shaping with the spokeshave. Auriou rasps are made in France. These are excellent rasps but they are expensive. If my pattern makers rasp gets lost or is broken I will definitely be replacing it with one of these. These rasps cut incredibly fast and are very sharp the teeth are set by hand. Files are very versatile hand tools. Files generally produce a finer cut therefore they are typically used after the rasp has taken off most of the material. In guitar building I use file for a host of things. A 1/2″ tapered round file is great for shaping the tuner slots on the headpiece. Flat files can be used to flush the ends of frets, fitting bindings and purflings and rounding the edges on the instrument before finishing. I also use files to clean up the barrel of the neck after first using the rasp before sanding. Guitar building requires a variety of measuring and marking tools. The types of measuring and marking tools you will need are covered in the video above. For marking your best choice is a knife. The thin tip makes a very accurate mark. The shallow cut left as a mark will not come off easily which is a good thing. Pencil marks are easily wiped or sanded away before you get to make your cut. If you mark with a knife or sharpen your pencil to a knife edge you marks will be much more accurate. It is best practice to use your hand tools for most of the work so there is very little sanding to do when you are done. In the shop the coarsest grit sheet sandpaper I have is 220. I usually have on hand 220, 320, 400 and 600. I use micro mesh in 2400, 3200, 3600 and 4000 grits for finishes. For sanding you will need a variety of pads in different sizes and shapes. There will be instances where you will need small pads, large pads, pads with rounded edges and so on. You also need pads made of different material to fit the application. Sometimes it will be necessary to be able to flex the pad in order to get the job done. Other times you will need a hard flat surface for the pad so that you don’t sand dips into the surface. I have fashioned many of my sanding pads myself for better results in certain applications. 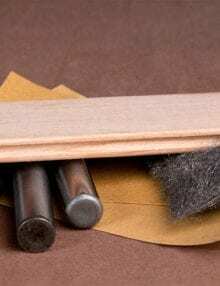 Neoprene sanding pads are soft and great for finish prepping. You should always use neoprene pads for micro mesh. For anything where you want the surface to remain perfectly flat, such as fitting, joining, and surface prep a harder pad may be necessary. For hard pads use Baltic birch plywood or MDF as they are typically flat. Thin gasket cork on the bottom will provide a good cushion for the paper. The gasket cork will not crumble from use as regular cork will. During my apprenticeship we did a lot of laminating and veneer work. When applying glue for these types of jobs you need to get it on quickly and evenly. To do this we always used rollers. Once you use one you will always use one. Glue rollers work best on large surfaces. They get the glue on quickly and evenly. There are many instances where you will need to apply a thin bead of glue. Examples of this are edge joining, gluing on braces, patches and gluing just anything narrow. Small accordion type squeeze bottles are ideal for this. The long narrow stem enables you to get just the right amount of glue on these types of surfaces. There are glue rollers and squeeze bottles available in the store. You will also need some glue brushes. The small black bristled brushes sold at woodworking supply companies are perfect. Sometimes a glue brush is the only thing that will get the glue on in a certain place. It would be difficult to put a top and back on without one. A small kitchen timer is indispensable in the shop. I use one to alert me when enough time has gone by to clean glue squeeze out. If left on too long the glue can be a bear to get off. If removed too quickly you can make a big mess. With the timer set it always gets cleaned at the right time and comes off easily. I used a timer for this purpose throughout the guitar making video . I could not build a guitar without masking tape. I go through about one roll of masking tape every two guitars. That’s a lot of tape. The type of masking tape I recommend is the blue 3M tape you see in Home Depot. Do not use the beige painters tape. It does not come off as easily. There are also a couple of different adhesion strength tapes. Medium adhesion and high adhesion are recommended for most guitar building tasks. They used to sell low adhesion tape but sadly not any more. Low adhesion tape was great for masking off the top for the bridge. Medium will have to do now. High adhesion tape is used things like installing the bindings and purflings. Double sided tape allows you to clamp things where you cannot possibly use a clamp. Tuners use this tape to hold bowls onto the face plates of their lathes, that’s how strong it is. Make sure you buy turners double sided tape at a woodworking supply company. This stuff really holds. The rest of the stuff on the list is pretty obvious and needs no explanation.